Many might perceive “fashion” to be something reserved for a chosen few, or only for those deemed fit to grace a magazine: celebrities, models, or those living the so-called “high life.” However, to designer Boyet Fajardo – now a successful household name in Filipino fashion design – his work in fashion is a way to make lives better for more people. As a recipient of miracles himself, he desires nothing less than to be one to others. He pioneered Plus Size fashion in the Philippines. He says that before, women who were on the bigger side were not thought of as deserving to wear something as beautiful as their smaller counterparts. Or, they were given awful euphemisms. “Before, when you ask, ‘where is the big size?’ you are pointed to the dark corner where there are nothing but dasters (house dress). And we called those who asked “matron, donya, lola.” There are so many words for them, which were really bad. It’s as if they have no right to wear something nice! And no designer would dare to touch plus sized clothing. Big women were relegated to nothing but dark colors, ¾ sleeves and closed necks. “God – they were like suman! So my line was really a big hit!” A big hit indeed, also for Robinson’s who had enough foresight to sign him up immediately. 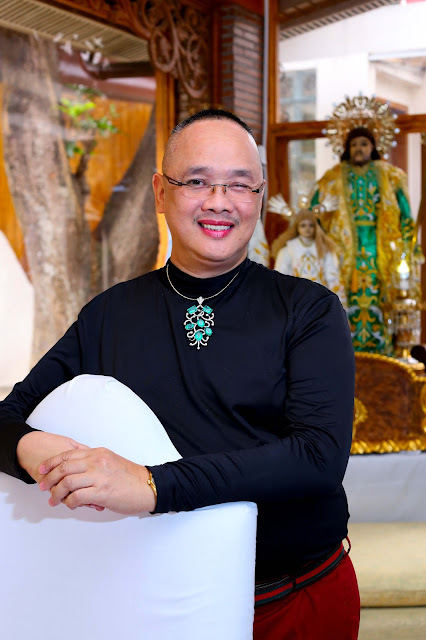 As a designer for plus size clothing, Boyet not only made a mark in the industry, he made his first considerable fortune. He was also able to make better clothes available for those whom society excluded from the fashion world. “I won’t lie that I didn’t make a fortune. That was the time when success came into my head. I was really making millions and millions. It became a necessity for the plus size people because my clothes are complete, very well done and I was the cheapest. That’s why they (other designers) were so angry with me!” Quality and affordability became the key drivers of his RTW business. Boyet Fajardo sees the needs of the market, arguably even beyond the usual designer. Now, he also has an advocacy for Persons with Disability (PWD) and works with Ephpheta Foundation for the blind. He has a special heart for people who have this disability, because he himself was born with it. “There are so many people who are blind simply because of poverty! What can I do? My heart breaks because of them. They go blind because they cannot afford a simple cataract or a simple glaucoma operation. So this involvement with Ephpheta, who does outreach for the blind, I helped them by investing in a machine that could help restore sight to the afflicted,” he beams. He received an award for his efforts with the PWD(Inocencio Magtoto Memorial Foundation), as he extended his outreach even to those who could not walk and to the PWD who would not be accepted into jobs simply because of their handicap. These, to him, seem to be not just CSR efforts on the side, or the cliché of “giving back to society.” His using his gifts for those less privileged or those marginalized because of their handicap, is borne out of understanding first-hand how it felt like to be maltreated because of disability. He himself struggled with a descent into darkness. A designer, for whom his eyes were one of the most important tools of the trade, was now legally blind. The second time had cinematic proportions. “It was dawn. I was brought to a farm. They told me it would at least allow me to breathe fresh air. Little did I know it was there that they wanted me to die.” He tried to escape his dire situation by trying to have himself killed on the highway, as the rain kept pouring. However, thankfully his loyal associate, Bing, had found him before he could do himself harm. Looking back on that unfortunate night, he was so thankful to Bing for protecting him. But that was not the end of his suffering. He swears he went mad, even smashing his own head on walls. And if not for the intervention of Bing and those around him who put a towel on his head, he would have broken his head, and what was left of his spirit. In the course of his blindness, he went to different sources for treatment: doctors, faith healers, and in his desperation to take away the darkness plaguing his life, he even went to exorcists. Then the light came. And he attributes it to nothing short of divine intervention. “Doktora kayo na po ang bahala. Kahit anong gusto niyo, bahala na po kayo,” he replied.Then as if it was so simple after all, the doctor said, “Tara, let’s go to the eye center”. “Maybe she thought I didn’t have money, so she asked ‘Do you have 2,000?’ to which I replied, ‘Meron po.’ “The doctor then said, “O sige, 2,000 ang charge kosa’yo”. He recalls being stunned: “I had already spent millions over the course of the two and a half years, but here she was offering redemption for only P2000.”He didn’t fully believe in the effectivity of the treatment at first, because, after all that he’d been through, could a simple 2,000 pesos really solve his eye problem? However, “In about 10 minutes, I had gained my sight back in one eye! That was the first miracle of God. I could see!” He was so ecstatic he ran to the lobby of St. Luke’s Medical center and shouted with joy. “Nagtatatalon ako and nagsisisigaw. I just went wild there, that’s why they probably won’t forget me! I could see!” He even finally got to see the plate number of the car, which he had bought when he was still blind. 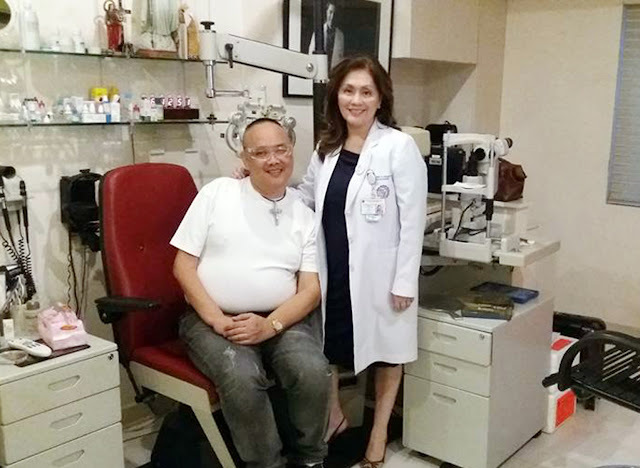 When he was finally seeing out of both eyes anew, he cut cloth, created an outfit, and gave it to Dr.Minguita Padilla who soon became a true friend in life. This doctor who was giving a talk abroad was able to tell the audience, “This was made by a patient who was blind. Now, he can see.” Amazing grace told through a designer’s life. That is why from Plus Size Women to the PWD, he tears down the traditional walls of fashion design so that more people will benefit. To him, it’s about designing a way to help others more. And to him and those whose lives he touched, these miracles will always be in fashion.